Twenty years ago this July, NASA’s Pathfinder mission landed on Mars. 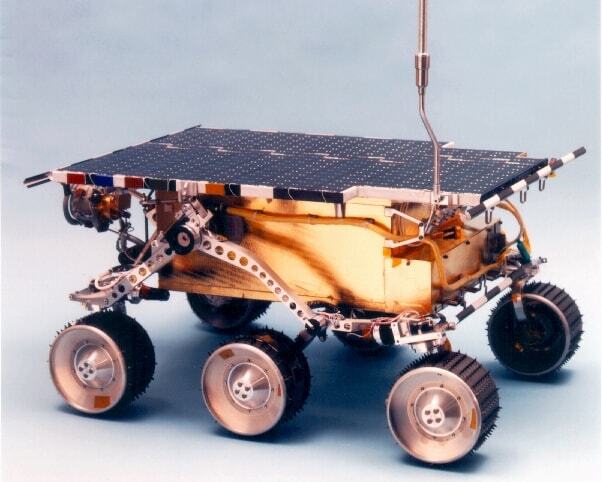 Pathfinder’s Sojourner rover was the first to explore Mars, and the mission itself was a demonstration of NASA’s new “better, faster, cheaper” methods for space exploration. Ira reflects on the landing, which Science Friday covered from the lawn of NASA’s Jet Propulsion Laboratory on July 4, 1997. IRA FLATOW: One last thing. It was 20 years ago this 4th of July we were broadcasting live from the lawn of NASA’s Jet Propulsion Laboratory, awaiting news of the landing of the historic Mars Pathfinder. We were just starting the program when the welcome news caught all our mission scientists guests by surprise. Perhaps you remember this. Welcome back to talk of the nation Science Friday. I’m Ira Flatow. We’re talking this hour about the Mars Pathfinder landing here where we were coming to you live from the Jet Propulsion Laboratory in Pasadena, California. In the background you can hear mission control applauding. SPEAKER 1: We have confirmed that the spacecraft has now completed paddle deployment, and we’re transmitting our final semiphore on the low-beam antenna. IRA FLATOW: Yeah, there’s a little bit of excitement here in Pasadena. IRA FLATOW: That last wow was Donna Shirley, Mars exploration program manager, 20 years ago this July.